Watching an experienced fly fishermen as a novice can seem daunting. The fly fishermen has casting and holding his rod down to muscle memory. Although learning to use a fly fishing rod and reel looks intimidating, it can actually be quite easy once you get the basics down. This concise report will guide you through the process of learning to fly fish and picking out a fly fishing rod and reel. Before you can get started in fly fishing, you should first determine whether fly fishing is appropriate to do in your favorite fishing hole. Even the best fly fishing rod and reel combination will not catch fish in a body of water meant for bait cast or saltwater rigs. A fly fishing reel is best used in a river or a body of water with a current. A slow lake or pond is difficult to fly fish in, because it is hard to pinpoint where the fish are located. The next hurdle to conquer is figuring out how to cast your fishing pole. Fly fishing rods are cast in the opposite way than traditional fishing. Fly fishing requires the angler to cast the line first, and the lure follows the line. The most important step is to load your fly rod correctly. This may scare novice fly fishermen, but you will feel the rod bend during a cast and this means that you are casting correctly! Once you have found a suitable spot to fish and you know how to properly cast a fly rod, you are all ready to go fly fishing, right? Wrong! You are forgetting the most important aspect of fly fishing: using the correct rod and reel combination. Anybody can walk into a department store and purchase a fly rod and reel set. However, if you are seriously looking to get into fly fishing it is imperative that you use a high quality fly fishing reel. When asked how they managed to catch so many fish, an experienced fly fishermen may tell you that it was due to luck. Rather than luck, the fishermen most likely had a good rod and reel combination. A good fly fishing reel can be the difference between shooting fish in a barrel or a bust. Fly fishing rods typically come without the reel. When purchasing a “naked” fly fishing rod, you have to understand that you will also have to purchase a reel before being able to use the rod. When purchasing a fly fishing rod, you will have the option to purchase fast action, medium action, or slow action. Action refers to the flexibility of the fishing pole. Fast action fishing poles are not recommended for beginners, because they are difficult to control initially. Most new fly fishermen start out on medium action poles, because they are the most versatile. Medium action poles may be used in the same conditions as both fast and slow action, and they are easier to use than fast action. Once you have purchased your “naked” fly fishing rod, it is time to shop around for a suitable fly fishing reel. There are a magnitude of fly reels out on the market, but some reels are better than others. The 5 best fly fishing reels out on the market today are displayed below. The Okuma SLV is the reel for you if you are looking for a quality reel at a reasonable price. The Okuma retails between $30 – $50 dollars depending on the size of the fishing line. Typically the thicker the fishing line, the higher the price. The Okuma SLV is made out of a die cast aluminum frame. The frame will be made out of aluminum through and through with no other cheaper materials thrown in. The spool is made out of stainless steel material, and the washers are also stainless steel. Stainless steel is fantastic to find on fly reels, because they prevent rust from building up in the reel. The reel comes with non-slip rubberized handle knobs. This non-slip grip will prevent you from accidently tossing your fishing pole into the water the next time that you hook a big one! The downside to the Okuma SLV is the weight of the reel. The Okuma SLV weighs approximately 11.2 ounces. Compared to the other four reels, this is the heaviest one. The additional weight is primarily due to its price. The higher quality aluminum used in the other reels is considerably lighter than the aluminum used in the Okuma SLV. Lamson is company based out of Idaho that has been producing high quality reels since 1995. Because they produce only the highest quality reels, the price reflects it. The Guru retails between $140 – $250 dollars depending on the size of the reel. Out of the entire Lamson reel family, the Guru is the most affordable line produced. The Guru is a new reel line released by Lamson meant to be maximize structural strength while minimizing weight. 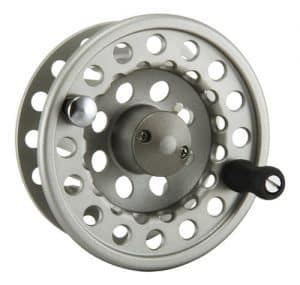 The reel itself is made out of machined aluminum and stainless steel. The weight of the Guru does not exceed 5 ounces, even with the larger spools. This makes the Guru an incredibly lightweight reel! Machined aluminum reels are very durable and always lightweight. 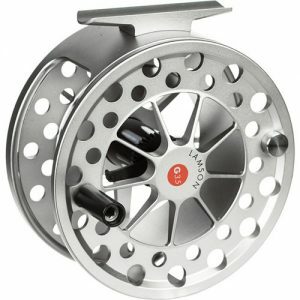 The Lamson Guru reel also has a large arbor reel. The large arbor reel is ideal for fly fishing for larger fish species. You can also reel in a large arbor reel faster than a small reel, so you have a better chance of reeling in larger fish! The drag on the Guru is fully sealed. This prevents gunk, water, and mud from getting inside of the reel. For those that are hard on equipment, the Guru would be perfect for you! The Okuma Helios is also a fantastic value for its price. The Okuma Helios retails between $85 – $195 dollars depending on the spool size. Okuma offers a free five year warranty on the Helios reel, which means that they stand behind their product lasting a decade at the minimum. The Okuma Helios is composed of solid, machined aluminum. There are no plastic or cheap metal parts in the Okuma Helios. This makes it a great reel, because many companies include plastic parts in the inner works of the fishing reels. The Okuma Helios is solid aluminum all of the way through. Despite being solid aluminum, the Okuma Helios is very lightweight. The average reel weight is a low 7.2 ounces. It is incredibly light, and will barely be noticed on the fly rod! The drag system on the Okuma Helios is maintenance free and waterproof. This prevents the drag system from rusting, and prematurely falling apart. Since the reel is going to be exposed to a lot of water throughout its lifetime, it is important that none of the parts will easily rust. The drag system is also a multi-disc system. This allows the fisherman to easily access the drag wheel by twisting the drag knob on the back side of the reel. 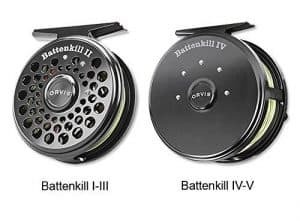 The Orvis Battenkill reel retails between $98 to $150 dollars. The price range puts it as a definite contender with the other four reels. The Battenkill reel contains a relatively simple reel design, and it is modeled after their old timey classic reels. This makes the Battenkill reel aesthetically beautiful. The drag system is so simple to use that a caveman could use it! The Battenkill has a four position click and pawl drag system which is adjusted internally automatically. The four position click and pawl drag system will prevent your fishing line from running wild the next time that you catch the big one. The Battenkill reel also has a narrower spool with a greater diameter than most other reels. This prevents the line from stacking on top of one another as you are reeling your line back in. In addition, whether you are right handed or left handed, the Battenkill is easily adjustable from left hand to right hand retrieve. The Battenkill reel is made of heavy duty, bar stock aluminum. This means that the reel is light weight, and will last ages. Compared to the other reels, it is slightly heavier at 9.5 ounces. However, this difference is minimal and will likely not affect your fly fishing performance. 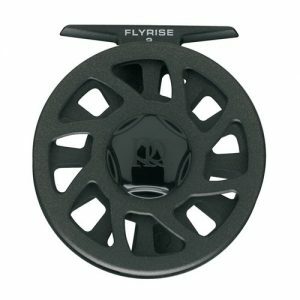 In terms of price, the Ross Flyrise sits slightly above the Okuma SLV Diecast Aluminum Fly Reel. The retail price of the Ross Flyrise is $80. The Ross Flyrise is classified as a large arbor reel. This means that it performs well in both fresh and saltwater fly fishing. 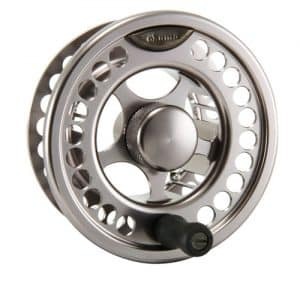 Not many reels are able to be used in both freshwater and saltwater. The drag system on the Ross Flyrise is set up with an adjustable disc. The adjustable disc allows the fisherman to turn the drag knob when they catch the big one! Some large fish need extra room to run before they get tired out. A drag system worth its salt will allow the drag to release even under pressure. The Ross Flyrise also boasts an aluminum frame, bronze brushings, a stainless steel spindle, and Teflon drag material. All of these items are durable, heat resistant, and self-lubricating. This means that they will be able to take a lot of abuse while out on fishing trips. You will not have to worry about dropping your fishing pole to the bottom of the lake, or take it out in extreme weather! The Ross Flyrise does come with a warranty if the reel was to prematurely break. However, the impeccable quality should prevent the reel from falling apart before a decade.